Microsoft's Windows OS has come a long way, but it's still not perfect. Just as anyone who's experienced the infamous Blue Screen of Death recently. When Windows crashes in this fashion—screeching to a halt, often when you're smack dab in the middle of an important piece of work—searching for a cause is often a frustrating, unfulfilling experience. But the notorious "blue screen of death" doesn't have to leave you scratching your head if you fire up the portable version of the handy utility BlueScreen View. BlueScreenView's information may be difficult to comprehend, but with the help of Google, you can find out what's ailing your PC. 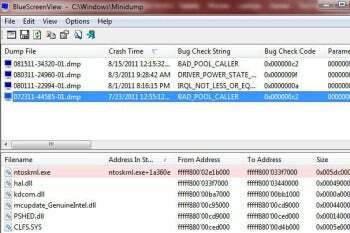 It scans Microsoft's minidump files, it's free, and it doesn't require installation. These files, which are automatically created when Windows crashes, are typically saved in your computer's C: drive; BlueScreenView knows exactly where to look for them. You do need to make sure your system is saving these minidump files, as most Windows PCs will, unless they've been modified. If you're having trouble accessing any data, view BlueScreenView creator Nir Sofer's blog. He offers tips on how to do so there. BlueScreenView presents you with a list of dump files, which are labeled with the time of the crash, making them easy to identify. The rest of BlueScreenView's data is a little tougher to decipher, especially if you're not very tech savvy. It gives you information such as the "Bug Check String" and "Bug Check Code," as well as parameters and drivers that may be to blame. This information may look like gibberish, but scanning through it will allow you to see patterns that have developed. I looked at four recent crashes that hit my Windows 7 PC and quickly realized they were all caused by the same driver. A quick Google search with the name of that driver offered me all the info I needed to get things fixed. With portable utility BlueScreenView, you can see the mini-dump info that Windows saves when it crashes with a blue screen of death.